An interesting flavour combination, achieved by combining KNORR Sakims Chinese Lemon Sauce and KNORR Japanese Teriyaki Sauce. The dish goes beautifully with salmon. Quickly marinate and grill for a quick meal idea. Combine KNORR Chinese Lemon Sauce GF, KNORR Japanese Teriyaki Sauce GF and sesame oil in a non-metallic bowl. Cut salmon fillets into 2cm cubes. Add salmon to marinade and toss to coat. Cover and refrigerate for 15 minutes. Thread salmon onto 20 small skewers. Grill or pan fry skewers for 10 minutes or until cooked through. 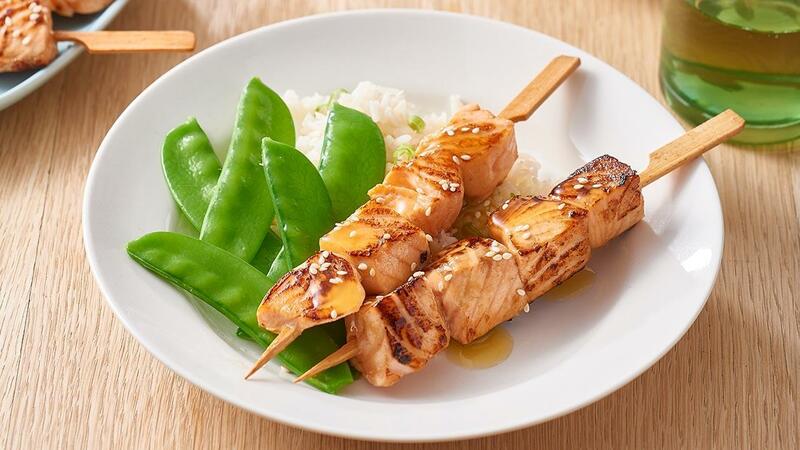 Sprinkle salmon skewers with sesame seeds and serve with extra KNORR Sakims Chinese Lemon Sauce, rice and steamed asian vegetables. For dementia patients, cook cubed salmon without skewers if preferred.